RETHINKING LA - The LA Department of Transportation has weathered the recent stormy days of employee misbehavior, administrative misconduct, budgetary misappropriations, and outreach miscommunications, resulting in a leaner, meaner department that is poised to take care of business. That’s Good News. The LADOT is passing up on opportunities to engage the community in traffic congestion solutions, parking solutions, complete streets solutions, and standards driven enforcement, resulting in a much meaner department that is willing to enter private property to cite vehicles parked in residential driveways. That’s Bad News. These citations aren’t given to that guy who runs an informal auto repair shop in the driveway of his home, subjecting the neighborhood to toxic waste, to visual blight, and to industrial quality traffic that is forbidden in residential communities. No, not him. The citations don’t go to the guy who parks his semi-trailer rig in his driveway, turning a local community street into an industrial truck stop, complete with an engine that idles at all hours as he tunes up for the next delivery of Barbie Dolls or Broccoli Spears to the Midwest. Again, not him. The citations certainly don’t end up on the windshields of the personal vehicles of residents who park in driveways and block the sidewalk, making it impossible for the disabled to enjoy local neighborhood mobility. In fact, the LADOT is working to legitimize motorists who park their cars on public sidewalks, after all, it’s a parking solution! No, the citations end up on the windshield of a car owned by “Sun,” a woman who bought a four-unit property several years ago and then applied to the City of LA for a class "A" permit that would allow her to install driveway curb cuts, creating access to off-street parking. Permit in hand, she upgraded her property (built in 1921) and proceeded to park two vehicles on paved parking spaces that are behind her well-maintained required front yard set-back. During the permitting process, BOE asked "Where do you plan to park?" Sun responded "In front of the building but behind the front yard setback." Then BOE wrote on the actual permit "per B&S OK to park behind setback line." 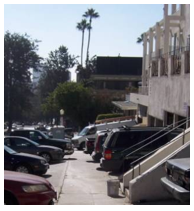 The LADOT initially engaged in a relentless onslaught of citations at this two-space property in 2007 when it averaged four citations a week in the month of January. “Sun” appealed to the LADOT and the wave of citations were reversed by the local LADOT’s Parking Enforcement Captain. The issue appeared to be resolved. Again, the issue appeared to be resolved. The Bureau of Engineering then got involved and reversed its original position, deciding that the owner who followed the rules, pulled the necessary permit, and paid the required fees was now out of compliance. In spite of protests from the local neighborhood council, neighbors, and community advocates, the BOE reversed its position and left Sun adrift in a morass of jurisdictional contradictions. The law is specific, and Sun responded specifically by researching and complying with the City of LA’s rules, regulations, codes, and laws. She was even charged for the appeals process in spite of her victory. Sun has spent more than four years navigating a journey that has meandered through City Planning, the Bureau of Engineering, the Bureau of Street Services, the Department of Transportation, Building & Safety, the Council Office, two neighborhood councils, all without resolution or relief. Meanwhile, scofflaws ignore the LADOT with such impunity that the City Controller recently released an audit detailing the millions of dollars in lost revenue due to the LADOT’s failure to address vehicles illegally parked on the streets of Los Angeles. As for the property owners who are committed to playing by the rules, abiding by the code, adhering to the process, and respecting the system, the reward is punishment, ongoing and relentless punishment that errs in favor of citation and penalty, even charging for the right to appeal. Sun, who saved her money and invested in the community by purchasing property that is now her home, has been taken on a fatiguing ride that would cause most people to simply give up. But they picked the wrong property owner. The City of LA has spent over four years engaging in an assault on Sun's use of her private property, in spite of her permits, her receipts, and her ongoing compliance and adherence to LA’s Municipal Code. There was a lull in activity from the Bureau of Engineering, from Building & Safety, from the Housing Department, and from the LADOT's Parking Enforcement, lasting until last month when...they're back! The LADOT has once again taken to entering private property during the late hours of night to enforce rules that its management acknowledges it has no business enforcing. First, forgoing a standards-driven enforcement process in favor of a complaint-driven system rewards complaints, enforces the law unevenly, and starts the fee/penalty clock based on complaints, regardless of their merit. Second, the Mayor’s cost-recovery mandate drives departments to gouge the law-abiding members of the community and to ignore the scofflaws, focusing on revenue instead of standards-driven compliance. Third, when a property owner has to deal with several departments, none of whom can resolve the issue but all of whom can levy fees, fines and charges, it’s evident that the purpose of City Hall is to consume and to staff, but not to perform. The City of Los Angeles, from the Mayor to the local LADOT Parking Enforcement Officer, exist to serve the public, not to persecute, punish, and penalize those who invest in their community and call LA their home. It’s time for the LADOT to step off the private property and to get out of the way. It’s time for the city departments to stop looking at the people of LA as revenue opportunities. And it’s time for Mayor Villaraigosa to get the city machine in order and to start delivering city services to the people of LA, after all, that’s his job.